RSS is finally getting the recognition it deserves. SitePoint now publishes RSS, and large news agencies like the BBC, the New York Times and CNN also publish RSS feeds. Now, developers can integrate content from a wide range of producers within their own applications, giving users a greater incentive to return, and opening up new possibilities for application development. This article will show you how to create a server control based on the DataList to provide a self-contained and manageable way of consuming RSS feeds within your ASP.NET applications. RSS, RDF, AtomÃ¯Â¿Â½What’s the Situation? SitePoint’s Nathan Matias has written a Get Off Your RSS – A Quick Introduction to RSS, though there is more to know before we can start developing applications to consume RSS feeds. First, a quick history lesson. Think back to the late 90s. The Internet had boomed, stock options were looking rosy, imaginations were firing, and "push technology" was being touted as the next leap forward. Companies like Microsoft and Netscape both integrated push clients into their browser software. Start-ups like PointCase and Marimba were selling the virtues of having information pushed towards your clients rather than having them go and seek it for themselves. But while Active Desktop was being switched off everywhere, Userland software was pushing content in the first syndicated format, the <scriptingNews> format. 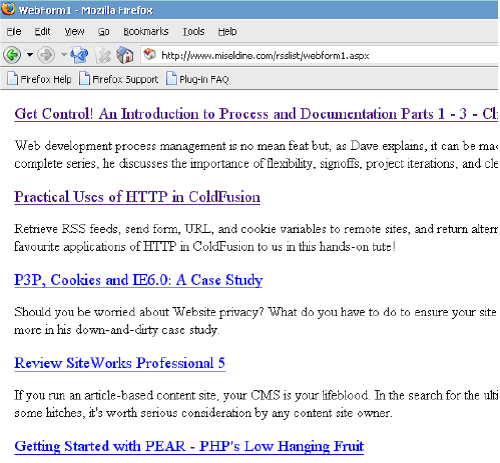 Netscape was also developing RSS, and in 1999 both formats were merged to produce RSS 0.91 and, shortly afterwards, 0.92. However, there was deep disagreement around how the format should evolve, and the specifications spilt, with RSS 2.0 being controlled first by Userland and now the Berkman Center at Harvard Law School under a creative commons license. RDF 1.0 is currently managed by a community user group. Now Atom, yet another specification, is being proposed with the backing of Google (the now owners of Blogger) and SixApart (owners of Moveable Type and TypePad). Just recently, a merger has been offered by David Winer, the founder of UserLand software, to combine the new features in Atom with the ease of the RSS format, thereby simplifying the whole process of writing and consuming feeds and, most importantly, getting the technology adopted within the mainstream. Today, developers have a dizzying array of specifications and formats to support if we wish to consume these feeds on our Websites. For our purposes, the different versions of "RSS" (i.e. 0.91, 0.92 and 2.0) can be treated as one; the changes to the specifications have made the core features backwards-compatible. However, RDF files use different elements and attributes to define syndicated content, so this needs to be handled differently than RSS. And, as the ever-changing Atom specification becomes more widely adopted, we also need a solution that lets us standardise all the specifications into a single format. This must be a format that we can process within our applications, but which also allows us easily to update the way in which we parse the files. Using XSLT, which is akin to stylesheets for XML, we can parse each format and produce a flatter, simpler format that we can use to populate a DataList object on our site for display. We can alter the XSLT file without changing our code, which makes the model adaptable to any future changes to the specifications. Let’s look how our control will work. I’ve chosen the DataList as the base control we’ll use, due to the fine-grained control it provides us over the presentation of data. First, we take in the feed the location of which is set in a custom property on our new control. We then apply our style sheet to the incoming feed to produce a common format that we parse to populate our DataList. Notice the ToolboxData attribute that’s defined for the class. This is the code that will represent our control when we use Visual Studio .NET to drop the control onto our ASP.NET Web page. If you’re using Visual Studio .NET, this is added automatically. The use of property accessors (get and set) is good programming practise. It allows us to control both the setting and retrieval of our new variable, while providing us with a private variable to which we along have access. We could, for instance, include validation within the set accessor for completeness. As it stands, we have a DataList control with an added property — the location of the URL. It’s now time to get to the nitty gritty and parse our XML files. To do this, we need to define our XSLT file and the format we’ll produce, which will be used to bind with the DataList. There are 3 different display objectives we wish to extract from our XML file and display: the title of a post, its link, and a description. How we derive these items is up to our stylesheet. For example, with RSS, we can add Permalinks (permanent links to resources) and date information to the description of the post. Indeed, we could build in support for a whole range of extensions and elements in our description (slash:comments, for example). In addition, we need to be kind to our feed providers, and to ourselves. Downloading the feed every time we have a request will slow down our bandwidth and might prompt the provider to block our future requests. To control performance, we will employ caching to serialise the contents of our transformed feed. The object will remain in the cache for 60 minutes by default. However, there are elements within RSS called TTL (time to live), which define the exact lifetime of the feed. To parse this value, however, will add complications to our design, but it’s a way in which the control could be extended in the future. This style sheet looks for the channel or item elements within both RSS and RDF files and applies a template to redisplay them. Notice that, in the description element, we have combined both the description of the post and the publishing date of the post (pubDate). This is where you can get inventive and add support for all those extra tags to make your display shine. // Load the stylesheet that creates XML Output. // Load the XML data file into an XPathDocument. // Create an XmlWriter which will output to our stream. // Create a dataset to bind to the control. // Select the data source, and bind. // Close the writer and thereby free the memory stream. We use streams to store our documents and transformations as there is every chance this control is going to be used by multiple users viewing different feeds. If we saved our results to file, we would run into problems as we tried to ensure we displayed the requested feed, and not some other user’s request that had overwritten our input! Using memory-based streams, however, each instance of our control has its own storage within the main memory, which makes it suitable for multiple user usage. Notice how an XmlWriter is employed to provide our stream str with an interface that’s suitable for us to write XML. Once the transformation has been made, we need to save (or flush) the contents of the XmlWriter to our stream as, at present, our stream is still empty. After we’ve written the XML data, the pointer position within the stream will be at the end of the data. Before we read it, we need to set this pointer back to the beginning of the stream. Another of our design goals was to cache the feeds to maintain good performance. The cache saves the XPathDocument instance which contains the feed specified in the Location variable. By caching this, our page will only download the feed once per hour, rather than downloading it each and every time it is requested. Notice that we need to grab the running instance of the cache as our control isn’t tied to any particular Web application. System.Web.HttpContext.Current provides the currently running HttpContext, which includes the familiar Response and Request objects and the Cache object. Now that you’ve completed the code of the control, you must compile the RSSDataList.cs file into a .NET assembly: RSSDataList.dll. If you don’t know how to do this, it’s covered in Kevin Yank’s article, Object Oriented C# for ASP.NET Developers. We now have 3 elements exposed to our DataList: title, link, and description. 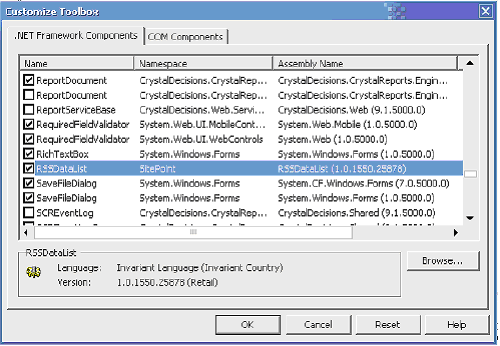 The display of these elements is handled within the Itemtemplate section of the DataList declaration. This process is very simple. To conclude, let’s walk through the process of consuming a feed using this new control. 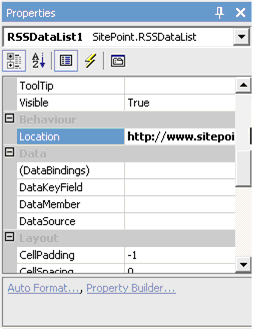 Right click on the control toolbox and select "Add / Remove ItemsÃ¯Â¿Â½"
Select the RSSDataList control from the list, and make sure the check box is ticked. Click OK to add the control to the toolbox. Make sure you have your XSLT file rss.xsl stored in the root of your application directory. That's all there is to displaying RSS and RDF files on your site!